Starcrash is an important work of art. We've waited all our lives to prove it. The proof is here. Check it out, man. So it seemed that the least I could do is take him up on the challenge. Stella Star (Munro) and her sidekick Akton (former child evangelist Marjoe Gortner) are being pursued by the Chief of the Galactic Police (Robert Tessier) and police robot Elle (legendary folksinger and short person Hamilton Camp). After they're captured and sentenced to hard labor, the Emperor of the Universe (a slumming Christopher Plummer) commutes their sentences in return for their aid in tracking down a missing ship carrying some guy who's developed a secret super-weapon and the Emperor's only son Simon (David Hasselhoff. Yes, him). Stella and her companions travel to various unconvincingly art-directed planets, locate the bad guy's secret base, and find the emperor's son. Things blow up a lot (yes, there is noise in airless space, thanks to the cinematic law previously by established by George Lucas) and eventually Stella and Simon fall in love. The End. In any case, the answer to our earlier question is -- really pretty bad, to the point where I have to assume that all the members of the aforementioned passionate cult are starved for entertainment to a degree that I find frightening to contemplate. The whole thing -- including several crate loads of model space ships that seem to be made from randomly glued-together Legos -- looks and plays more or less like a community theater production of a Friml operetta, and the video transfer (from an allegedly restored American release print found in producer Corman's garage) has the kind of gauzy, hard-to-watch quality one associates with viewing films with your head swathed in Saran Wrap. For what it's worth, the newly minted 5.1 surround track is passable, but that only serves to highlight the essentially tossed off nature of the Barry score, which is to say the guy did better work elsewhere. On the other hand, the set comes with a second disc's worth of bonus features, including outtakes, the original screenplay, and an interview with the still toothsome Munro. So if you have a taste for this sort of mishegass, you could probably do worse. 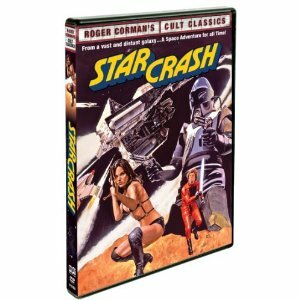 That being the case, you can -- although if you do, please don't tell me -- order Starcrash over at Amazon here. Need help along with your marketing content, essays, thesis, web copy, proofreading, editing, letters for business or legal and presentations including PowerPoint and Google slides. I Work at https://maxhomework.com/college-essay-help/ and I am available to help with classes online. Writing can be tough, This is why you will need a professional author that will help you.